The key to appreciating "The Naked Prey" (1965) is to go in with the understanding that nobody is right or wrong in this story. Everybody makes decisions based on their own unique backgrounds, and they live and die by those (sometimes wise, sometimes foolhardy) decisions. The deaths - and there are a lot of extremely graphic deaths - are gruesome and easily could give you nightmares. The only moral balance is struck by who outwits the other. This film isn't "anti" anyone, rather, it is pro-life and the struggle to survive in a hostile world. "The Naked Prey" used to be shown on local TV channels every few Saturdays, it seemed. Always made for a great viewing, and I saw deeper into "The Naked Prey" each time. The early scenes, which are easy to skip over on the way to the chase that dominates the picture, are actually among the most interesting. What the natives do to The Man's traveling companions, well, if you pay attention to that and really internalize what they are doing, you will never forget it. I sure haven't. This is a story (written by Clint Johnston and Don Peters) about recovering from disaster. Strangely enough, it is based on a true tale of trappers in Wyoming who were captured by Native Americans, though of course director Cornel Wilde adapted the tale for his own purposes. The protagonist learns that, capable as he is, he isn't "all that" and still must fight for his own survival. Along the way, he gets and earns respect, including from the leader (Ken Gampu) of the people chasing him. That's the bottom line for this film, putting it squarely in the "tough guy" roster of films that includes the likes of "Hard Times," "The Dirty Dozen," and "The Bridge over the River Kwai." This is a fantastic look at surviving by your wits and sheer natural ability in an alien environment. I'm sure it may offend some viewers, but so do a lot of films. I like that it is extremely respectful of just about everybody involved, though there are some villains and some heroes. You probably aren't going to like what they're looking at, so we'll leave that for you to find out when you watch "The Naked Prey." Cornel Wilde portrays a guide (called simply "The Man" in the credits) in Africa who leads a small safari through hostile territory. We are never told what year it is, or who he is, or any other details. He does mention that he has decided that this will be his last safari, after which he will retire to his farm, so he must be experienced. I imagine it is intended to be sometime around the 1930s, but it could be just about any time ("Little Brown Jug," sung in the film, was written in 1869 and became popular again in the 1930s). Understanding the natives, he begs the man who has hired him to pay a small tribute that has been demanded from a local tribe, but this is refused. The native who demanded the tribute is humiliated, and takes his revenge. 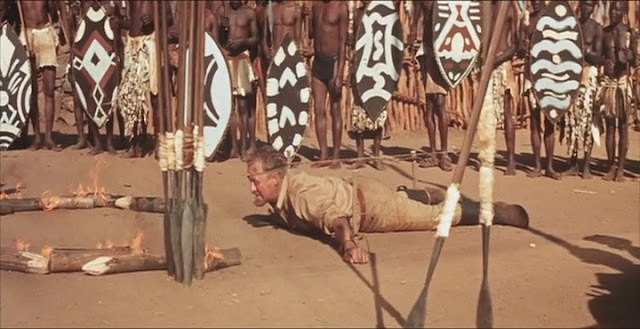 The safari is attacked, everyone but the guide is killed and eaten by the cannibals, and The Man is given the chance to survive only if he can outrun and outlast the best warriors in the tribe after a brief head start. Beautiful vistas in "The Naked Prey." There are so many fascinating aspects to "The Naked Prey" that it is difficult to list them all. It bravely shows native Africans in a light that is not always favorable - imagine that. But it does show many of them in a very favorable light, too. People on both sides are brave, or stupid, or cowards, or weak - imagine that, too. For a film to be racist, it would have to show all people of a particular group as being one way or another, good or bad. This film does not do that. However, to be fair, it was accused of racism when released in the 1960s, the irony being that Cornel Wilde was very liberal in his own political outlook. The Man's little dance after this is the best thing in "The Naked Prey." There is almost no dialog in "The Naked Prey." What dialog exists is often in native language (Swahili is mentioned at one point) other than English. Even the dialog that does exist is unnecessary - when one of the pursuers gets into an argument about not wanting to continue, turns around to head home, and is immediately speared in the back by the leader, we get the message. Again when another is bitten by a snake and is left to, most likely, die. What dialog does exist is often there just to emphasize the characters's emotions - such as when the Man sets fire to the jungle, delaying his pursuers, and he he jumps up and down with glee, taunting them as "devils." But he doesn't mean it personally, he just wants to get away and live. And is that not understandable? Would you feel differently? A chase scene in "The Naked Prey" - reminds me of work. 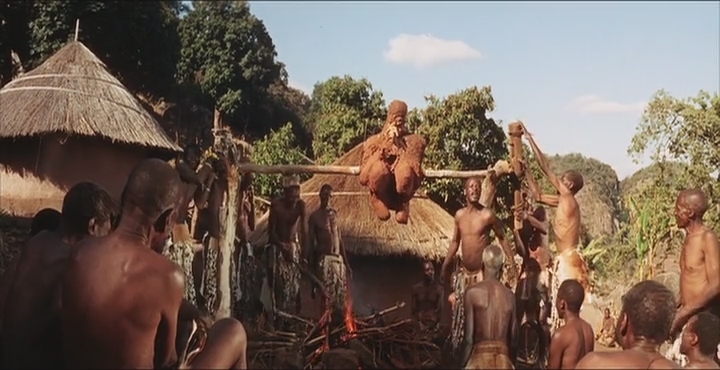 "The Naked Prey" has wonderful scenery of Africa - name me another film other than a documentary that shows the countryside in so much detail and splendor. I doubt you can. This is like going to Africa for a spell. So there are elements that are a bit unrealistic, such as the Man's ability to run through a party of marauding Arabs, kill the leader, and get away. So what? It could happen, taking an attacking force by surprise like that is completely feasible, much more so than the "Die Hard" guy bringing down an attacking helicopter with his bare hands. There are some truly horrible scenes in "The Naked Prey." How realistic they are is debated. And above all, it is a thrilling chase, with the ultimate outcome always very much in doubt. Wilde is in such superb shape (he was acclaimed as an athlete throughout his career) that you believe he could pull off the feats that he must to survive. Be forewarned - the early part of the film, right after the safari is ambushed and the people in it taken captive and killed, is extremely disturbing. Some of the images will haunt you. A key figure in "The Naked Prey" (Patrick Mynhardt) faces a unique form of death. 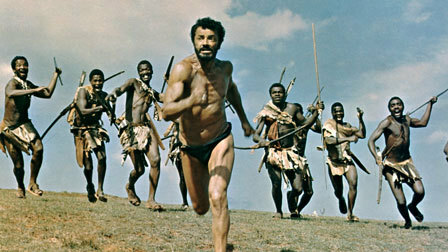 Cornel Wilde was in the preliminary stages of a sequel to "The Naked Prey" when he passed away, so it never got made. It is difficult to see how it could have been as good as the original. "The Naked Prey" is recommended, if you can stand the brutality and the portrayal of people of different races as individuals with good and bad aspects and not just symbols of something sinister.